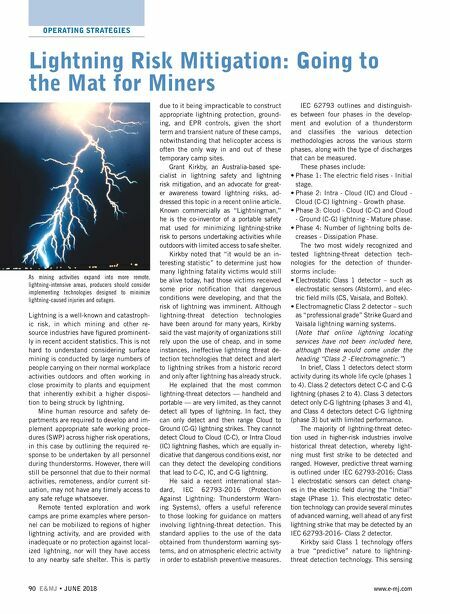 JUNE 2018 • E&MJ 91 www.e-mj.com OPERATING STRATEGIES of changes in the developing local elec- tric fi eld offers an unequivocal indicator as to the probability that the conditions for lightning are rising, and that a threat may be imminent. At the onset of localized thunderstorms, changes in the local electromagnetic con- ditions result in an intensifi cation that can be measured, where this local electric fi eld increases and decreases during the various phases of the storm's development and life. In either instance, this technology offers an improved means for identifying high-risk lightning conditions, well before the threat has fully developed. The technology offers higher-risk in- dustries the means to provide a timely forewarning to remove exposed personnel from greater risk exposure, before light- ning strikes. Additionally, diminishing E Fields can be monitored in real time, which is in- dicative that a storm may have passed, which may prompt an earlier return to productive operations, wherever higher risk E-Field conditions can be seen to have dropped to safe levels. The cost of this technology has come "way down," according to Kirkby, and the technology has moved ahead with such features as multi-system network connec- tivity, email notifi cations, SMS threat no- tifi cations, relay outputs for the interface to PLC/BMS, as well as proprietary con- nection to site-wide Wi-Fi based audible/ visual threat notifi cation beacons. Overall, Class 1 detection offers: • Improved "predictive" warnings as com- pared to "historical "warnings. • Improved personnel safety by alerting people to dangers before lightning has struck. • Improved productivity and reduction in false alarms. These detection systems sense chang- es in the electric fi eld from storms formed over the area being monitored, as well as to approaching storms located up to about 20 km away. This feature provides for several minutes of advanced warning prior to the fi rst lightning strike. This predictive technology is not meant to supersede the Class 2 threat detection, as historical systems have a much greater level of proven accura- cy with respect to active and incoming threats approaching the user's location, and Kirkby sees Class 1 Predictive tech- nology as an "over-watch" function that offers the most appropriate safety to out- doors personnel in higher risk industries. In 2010, Kirkby and Australian light- ning researcher Dr. Franco D'Alessandro began investigating possible areas of in- novation in the area of personnel lightning safety, and lightning risk mitigation. EPR (Earth Potential Rise) risk mitigation was a key area of focus, and they decided that if a lightweight and highly portable EPR control could be developed, this would prove an important risk innovation for reducing light- ning risk to certain higher risk workgroups. Five years later, they commercialized and patented the LightningMat EPR Safety Mat designed for portability and to provide a cost-effective and simple means for mitigating EPR hazards to ex- posed personnel via a unique three-layer fl exible mat design that includes: • A central, electrically conductive mesh layer that rapidly equalizes electrical potential developed across the mat. • An upper insulating layer that insulates personnel and assets from the electri- cally conductive central layer. • A lower electrically conductive layer that protects the central layer and provides electrical continuity to the central layer. According to Kirkby, the mat's layer arrangement provides a means for mit- igating EPR hazards arising from nearby cloud-to-ground (C-G) lightning discharg- es, and other electrical phenomena involv- ing large fault currents being injected into the ground. The mat works by redistrib- uting the surface voltage profi le associat- ed with EPR, so as to reduce differential potential gradients across the mat's struc- ture. Anyone standing on the Lightning- Mat during an EPR event should be equi- potential with the mat, and not exposed to signifi cantly differing and dangerous voltage gradients resulting from the EPR. Kirkby said the concept is simple: Think of a bird perched upon a high-volt- age power line completely unaffected by its direct contact with the wire, until the bird comes into contact with another phase wire, or earthed object, at which point the differential voltage will fl ow across the differential contact points. A key feature of the LightningMat, which measures 1 m x 1.5 m in standard form, is its fl exibility, which allows it to be rolled and unrolled as required, making it suitable for use in temporary, semi-per- manent, or even in permanent applica- tions. Individual mats can also be joined together to make a larger mat. A bonding kit is optional and brings the LightningMat to the same electrical potential as the long conducting element, thereby equalizing dangerous voltage dif- ferentials. And while the LightningMat can be used without an electrical bond to nearby touchable objects (since it re- distributes the surface voltage profi le), enhanced performance and voltage re- duction is achieved wherever an electrical bond is used, according to Kirkby. He noted that LightningMat does not remove the risk of direct strike, which accounts for about 3-5% of all lightning injuries), but is intended to reduce the 55-75% of lightning injury statistics that up until now, have had no commercially available risk mitigation control. Sandvik Reveals Digital Data Sharing Policy Sandvik Mining and Rock Technology has released its data interoperability policy, which specifi es how Sandvik systems, equipment and tools share data in the mining digital ecosystem. A description of the policy is now available on the My Sandvik customer portal. It outlines the principles by which Sandvik systems can communicate with- in a digital ecosystem, including data ac- cessibility, fl eet data compatibility, data rights, and control and data privacy. 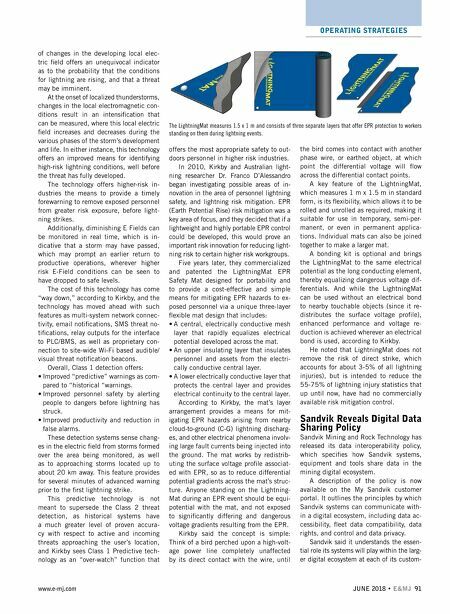 Sandvik said it understands the essen- tial role its systems will play within the larg- er digital ecosystem at each of its custom- The LightningMat measures 1.5 x 1 m and consists of three separate layers that offer EPR protection to workers standing on them during lightning events.